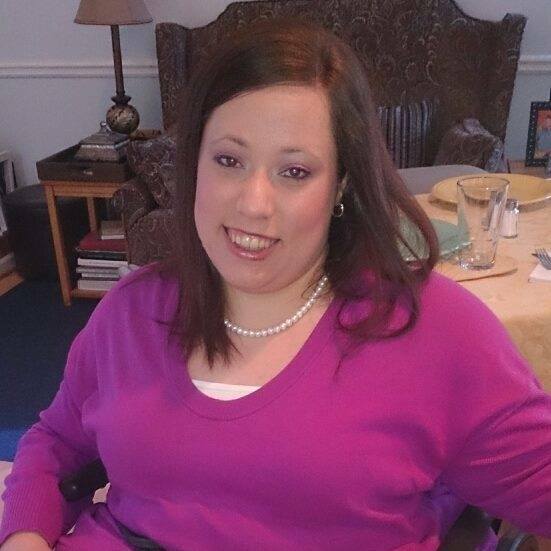 An avid supporter of SPINALpedia, 27-year-old Sophia Sanford of Georgia exudes positivity. Sophia was born with spina bifida resulting in a T12-L2 level injury. Her smarts and drive has helped her become an expert on the topic. She made it her mission to empower others with disabilities to live successful, independent and happy lifestyles through the daily far-reaching impact of a simple positive can-do attitude. After graduating from high school, Sophia took college courses at Gwinett Tech in GA. “I wanted to gain experience in college course work, learn how to schedule classes, and decide if college was for me,” she says. “I left after two years, but to transfer to a different school.” In 2015, Sophia graduated from Georgia State University with a Bachelor’s Degree in Criminal Justice. Since Sophia also has a learning disability, she substituted science and math classes (they would have been difficult for her to pass) so she could get her degree. Sophia is proud of her achievement, and hopes to professionally become a victim advocate or disability advocate. Here at SPINALpedia, we are hopeful and supportive of Sophia and her career goals. With all of her positivity and hard work, she will no doubt continue in a productive direction. What do you think is the biggest differences between someone very young or later in life? This entry was posted in SCI Superstars and tagged Georgia State University, SCI Spotlight, sophia sanford, spina bifida on July 21, 2017 by Tiffiny. A man with an eye to the future in a profound way, this is the amazing Stuart Turner. Six years ago is when Stuart’s entire life began to change. Formally able-bodied and an undergraduate studying computer science, Stuart began to suddenly notice lessened sensation throughout his body, and it was soon followed with a loss of movement. After a series of tests, Stuart was finally diagnosed. He had spinal bifida. a strange but not totally uncommon diagnosis to receive later in life. But he was also diagnosed with a tethered spinal cord syndrome and Chiari malformation, which is when some brain tissue extends into the spinal canal. Within months he progressively worsened, until he plateaued. Stuart can now only move his right index finger, but nothing more below his neck. He has the abilities of a C2 quadriplegic incomplete and must use voice technology for all of his computing. This has made him an expert in the field of accessible technology. For many years after his injury Stuart was housebound (his wheelchair couldn’t get into his bedroom), which was how he came upon a video showing the possibilities of drone technology for people with disabilities. Originally created for war, Stuart sees drones as a way for people with spinal cord injuries to escape the confines of their homes, wheelchairs or beds, allowing them to see the entire world. Excited about the possibility of robots, he founded RobotsandCake.com. This site wants to see more robots and other consumer technologies expand their reach to those with profound disabilities. Drones that can be re-scripted are some of Stuart’s most favorite technology in the world. He has hacked into several personal drones that can be purchased for personal use, making them work for his disability. He has been able to travel the world from the comfort of his own bed and see beautiful sights in places like Australia and Asia. Drone technology is definitely expanding our world in an amazing way. He is also now working with Brown University, designing what they call a “Quadcopter,” which will be a fully accessible drone not requiring any tinkering. He has been able to fly down the halls of Brown from 3,000 miles away whilst doing the research and is loving every minute of it. Stuart’s knowledge on the possibilities of personal drones, especially on how they can improve the lives of people with disabilities, has also attracted big names in the science field asking him to speak. Last year he spoke at WIRED2014 UK talking about drones and demo-ing a drone in the auditorium all from the comfort of his own home. He also spoke in 2015 for TEDx Youth, discussing the possibilities of the universe. A gifted speaker you can’t take your eyes from, Stuart has this amazing ability to connect with his audience. He dreams big, and he envisions a world where people disabilities can be as mobile as anyone else or even more so (drones can do some pretty sweet moves in the sky). And at only 36 years old, Stuart still has plenty of time to change the world in the way he would love to see it. We are on board with you, Stuart. We love what you’re dreaming and we support you 100%. Would you want to explore the world using a drone? This entry was posted in SCI Superstars and tagged Brown University, drone technology, drones helping the disabled, RobotsandCake, spina bifida, Stuart Turner, TEDx Youth science speaker, WIRED2014 Conference on February 19, 2015 by Tiffiny.